Auction houses are ideal platforms for judging buying trends which by default would also include prevailing values. In a recent sale at Dreweatts in the UK, 39 Chinese Export Silver delivered some surprises; it goes without saying that the majority of buyers were from China. The trend at this sale and recently at other auction houses is that Chinese buyers are appearing to become more discerning. Discernment, though, is in itself highly subjective and can often be at odds with expert opinion; when an antique object enters the commercial world of the auction houses it can often create a dichotomy of opinion between a buyer being ruled by the heart and the experts who are governed by established, conventional and academic perceptions. Chinese Export Silver is one of the largest silver categories; it is also the least understood, but it is not in the remit of any auction house to act in judgement – it is a facilitator acting on behalf of its consignees. So one is left with the conundrum should one educate the buying public or should they be left alone to judge acquisitions for themselves – and the price they are prepared to pay. If it is the latter, then there’s a risk that pieces that are worthy of being judged as exceptional fall into a new and unfortunate category of silver oblivion! However, in a situation where the silver being sold is Chinese in origin, that the buyer is Chinese yet the silver has spent the past 125 or so years in the West, there is bound to be what might seem at first glance a conflict. The reality is more likely to be that despite massive strides forwards in the past decade, Chinese people in general still retain a default traditional mindset. A good example is probably the fact that more Chinese people will instinctively turn to traditional Chinese remedies rather than instinctively buy generic off-the-shelf Western medicines. 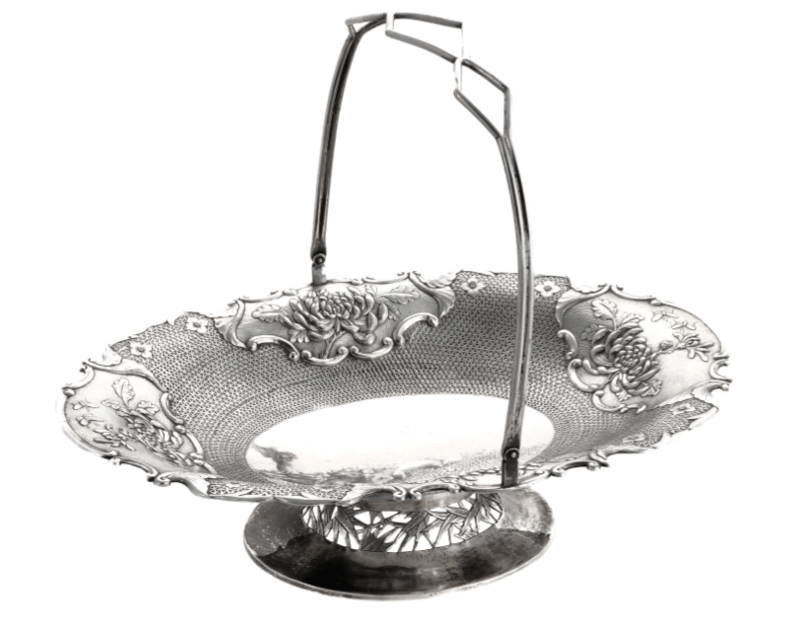 In the same way, silver items that display overtly traditional Chinese decorative motifs still naturally draw Chinese interest, while what Western “experts” have traditionally upheld as masterpieces in the shape of neo-classical Chinese Export Silver pieces currently might not intuitively be attractive. China is a nation in fast-track transitional mode; aesthetic appreciation will undoubtedly change as the nation finds its final place in the world order. The atmosphere of the auction room always changes at a silver sale several gears upwards when bidding for lots in the Chinese Export Silver section is reached and this was certainly so at Dreweatts’ sale on July 9th at Donnington Priory in England. Phone lines glow red hot and internet bidding is hard keep pace with. The surprise leader of the pack was this late 19th century Straits Chinese silver octagonal bowl and cover, intricately decorated with an engraved foliate motif and alternating side panels of a traditional shrew amidst fruiting vines, a bird amidst bamboo, a dragon amidst floating clouds and a flowering shrub – all set between finely executed meander borders. The bowl romped home at £8320 [$14,250]. 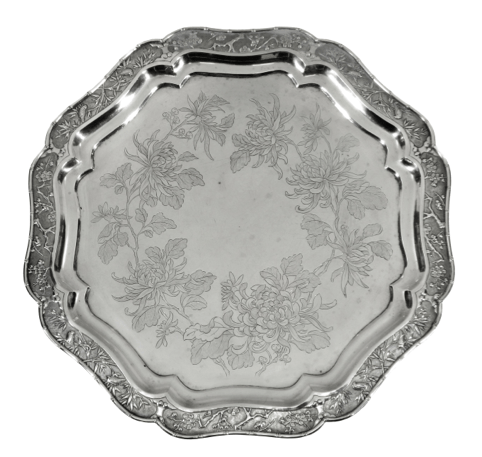 A handsome circa 1880 Chinese Export Silver hexalobed 15inch [38cm] diameter salver [above] bearing the mark of the Canton-based retail silversmith KC achieved £3500 [$6000]. Traditionally decorated with a chrysanthemum wreath motif centrally placed on the tray bordered by a raised prunus and bamboo motif interspersed with birds and surrounded by a narrow bamboo rim, the tray sits upon bamboo leaf bracket feet. An ornate late 19th century swing-arm oval basket by Wang Hing & Company [below], decorated in a neo-baroque style with four chrysanthemum-emblazoned rocaille reserves against a fine open trellis background, sitting upon a flared reticulated base of bamboo foliage sold for $1670. Certainly, over the past 5 years it has been interesting to see how the preferences of Chinese collectors has changed. There’s a noticeable degree of discernment now that was lacking five years ago, but it is equally intriguing to see patterns of interest developing that show a distinct difference to those of Western collectors. This particular sale confirmed a steadily growing interest among collectors in China for enamel and silver gilt wares that were very much a product of the second half of the 20th century, mainly from workshops operating in Beijing. Beijing has always been traditionally the spiritual home of cloisonné, but the former Imperial enamel and cloisonné workshops had almost all been closed by the beginning of the 20th century after the death of the Empress Dowager Cixi and before the eventual fall of the Qing Dynasty. A significant number of these workshops re-grouped and were encouraged by the demand for their work to open as independent manufactories and they managed to thrive until the fall of the Republic. In the new communist government regime, all private enterprise was either closed down or was consolidated into state-run factories – somewhat curiously, the new regime saw fit retain cloisonné and enamel production, even though it had no relevance whatsoever to the new order of communist ideals. An 11cm tall silver-gilt and enamel dome lidded filigree canister [above] decorated with applied hardstones, enamelled flower heads and leaves and embellished with rue and other scroll work was sold for $2,210. This 20th century work has evolved into a genre all of its own; like all genres, there is well-produced work and there is work that simply seeks to masquerade and take a ride a popularist band wagon. 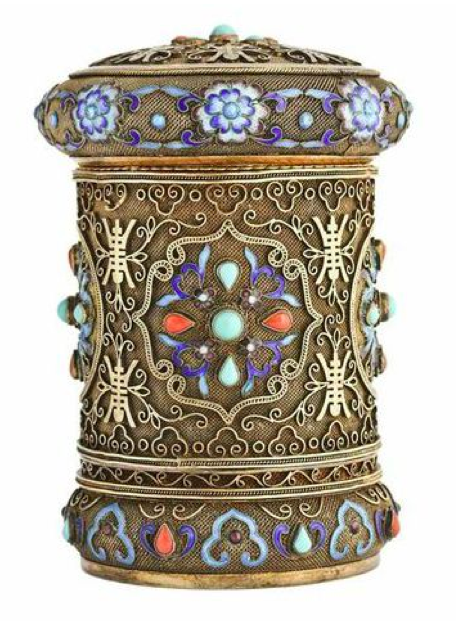 This particular canister, although 20th century, is an example of good workmanship. As a genre, it finds its roots in late 18th century Chinese Export Silver filigree work that was mainly created by Canton silver workshops and became a speciality of a handful of quality retail silversmiths such as Cutshing and Pao Ying, both of whom were known to be purveyors of such items to the Imperial Court in Russia; the largest known collection of this work can be found in the State Hermitage Museum in St Petersburg. 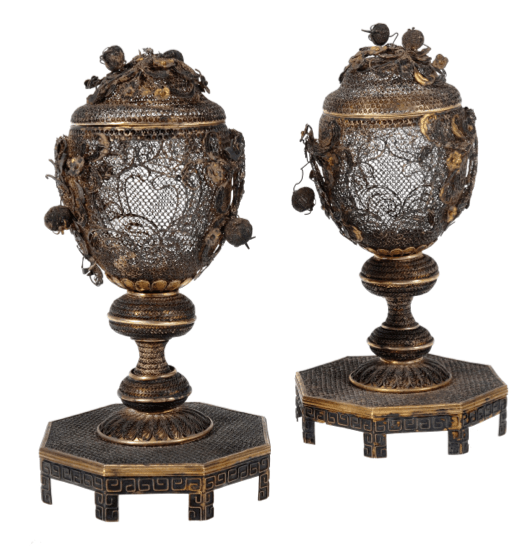 This impressive pair of late 18th century Chinese Export Silver gilt filigree pedestal lidded vases, although unmarked are typically in the style of Pao Ying, the domed lids and ornately worked ovoid bodies decorated with filigree flowers, foliage and fruits, all on a fine woven ground are exactly what the later 20th century wares strive to mimic. The stems of the vases are with ball knopfs on octagonal bases with fretwork edges and feet. Essentially, although 200 years separate the original wares from the contemporary 20th century items, the skills intrinsically remain the same. This 15.5cm tall pair of vases sold at Dreweatts recently for £17,000 [$29,000]. 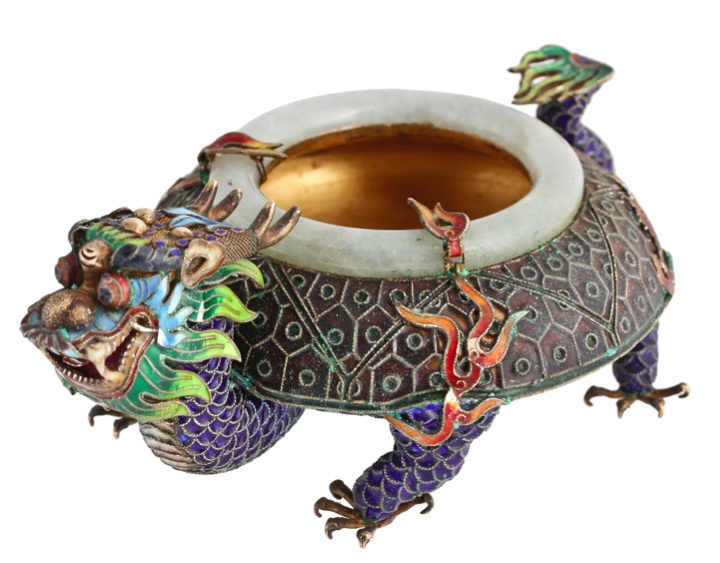 A rather dramatic small Chinese silver gilt and enamel bowl with a jadeite rim and brown and blue enamelled body and standing upon four dragon feet with five toes sold for $2,250. Again, this is typical work of the post-republic Beijing enamel workshops. 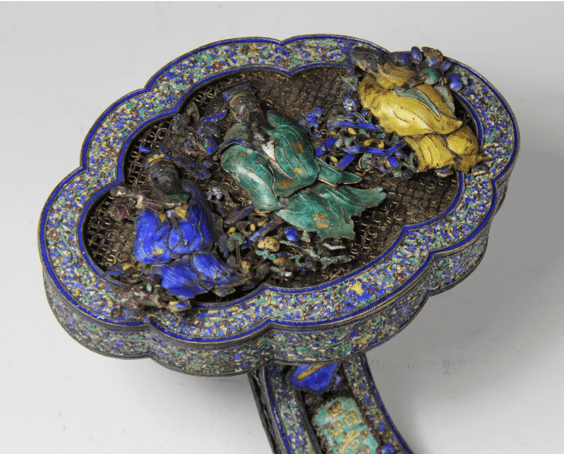 The exact location of the workshops of the Beijing maker Bao Xin are not documented, but it is highly likely they were situated within the Forbidden City complex since this maker created silver and enamel tribute pieces commissioned by the Imperial Court. They, too, were highly intricate filigree bespoke items and ceremonial sceptres were commonly presented. The head of one such a sceptre [below] clearly demonstrates the intricacy and high level of workmanship, but yet again the same basic skills are those that emerged in the “new genre” items of the 20th century. Such sceptres are rare, but would be generally expected to achieve $47,000 or over at auction, as the one pictured below recently did. 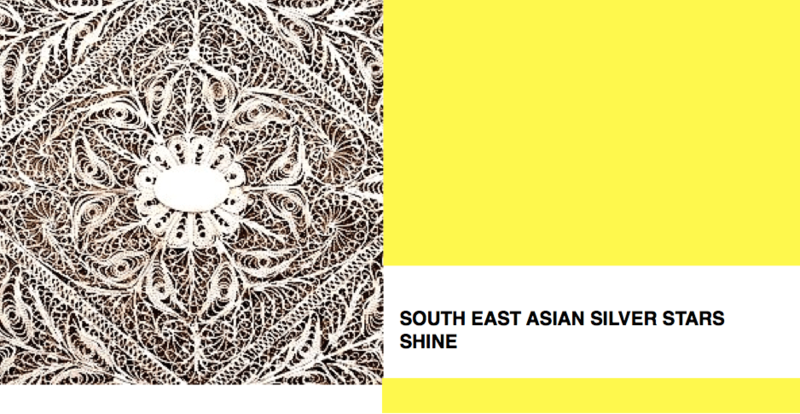 It is envisaged that the current interest in Chinese Export Silver will continue to grow and with that growth, an ever-increasing level of discernment. 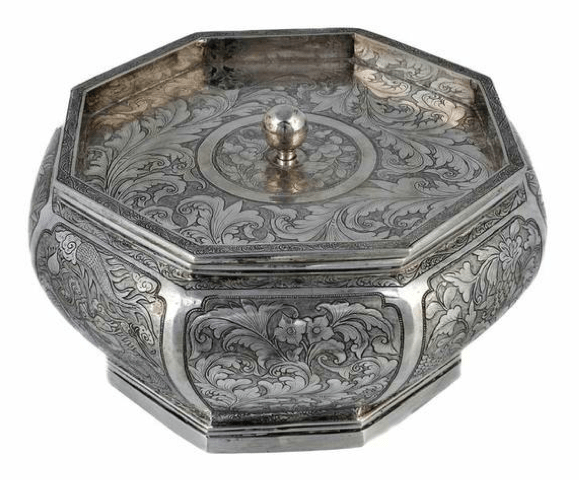 Given Chinese Export Silver is one of the largest categories of silver ever produced during its 155 year manufacturing period, there’s certainly a significant amount of “important” pieces still available to come to auction. As the understanding of Chinese Export Silver grows [and it will], in particular the important place it has within Chinese Culture from the late 17th century through to the end of the Republic era, a two-tier category of this silver will probably emerge; the important pieces taking the lead roles and being captured by the spotlights and the more “bread and butter” items forming the majority core – it should be stressed, however, that the latter are all high quality items with the former being the star show stealers. Hopefully a black hole of silver oblivion may be avoided.